At the beginning of his video Mr. Beck states that some people advocate for increased immigration with the purpose of “rescuing people from the Third World poverty.” I doubt that there are any sane Americans thinking this way; and if there are, I did not hear of them, and Mr. Beck does not tell us where they could be found. In plain words, the whole argument in the video is not against immigration, it is against a bizarre motive for increasing immigration; a motive that Mr. Beck validated for the purpose of this video. Americans who support immigration do it mostly because, first and foremost, it is good for them and it is beneficial for the United States. Let us imagine a meat processing factory somewhere in rural Iowa. Despite the increase in automation, a lot of hard and dirty work still needs to be done manually. In order to stay profitable, this factory needs to export a meaningful part of its production. This factory competes with similar producers all over the world; as in Argentina and Brazil, for example. In order to stay competitive the basic laborers need to be paid close to the minimum wage. Let us say that there might be, in the area, unemployed Americans, but most likely they would not take this kind of work, even if it paid double the minimum wage. For poor immigrants from a crime-ridden Latin American country, even a minimum wage job at this factory can be a lifetime opportunity to get on the path to prosperity for them and their children. Their work can keep a factory profitable in the worldwide market. Without them, this factory would need to close, and a few hundred Americans making a decent income in maintenance and management would lose their jobs. Furthermore, local farmers would sell fewer animals, with some of them going under because of it. With the factory staying open, not only all of them benefit, but this rural area needs to grow to house and feed the immigrants. This creates new jobs and enriches people in the community. In his video, Mr. Beck complains that to accommodate a population increase, we need to build new roads, new schools, and new sewer plants. He sees it as a burden; I see it as an asset. Thanks to the work of immigrants, our infrastructure is more developed than it would be without them. We have more roads, more schools, and more sewer plants. More people live here, but the country is richer too. Next, let us look at the numbers showing how increased immigration can help poor countries. Mr. Beck is correct that the best way to help people living there is by helping them where they are. In 2017, Mexico received $309 million in all kinds of help from the United States. But the same year, Mexicans living abroad sent home more than $28.8 billion, 93 times more than the aid. These numbers say plain and clear how wrong Mr. Beck is. Statistically, every immigrant helps several people in the country of origin. 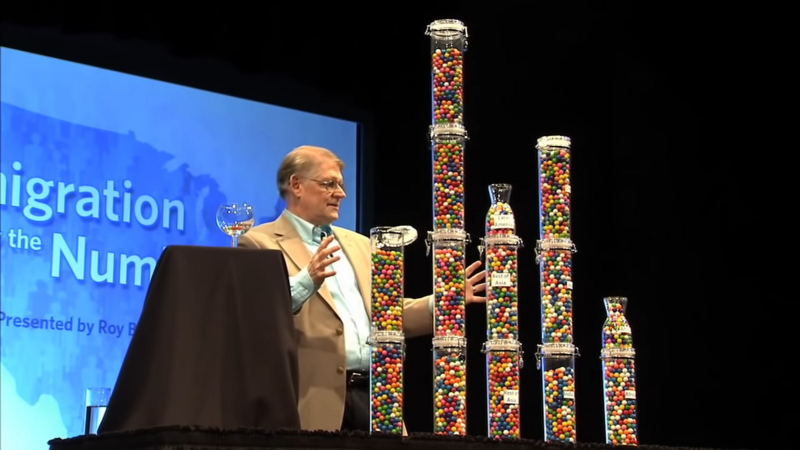 Despite being colorful and impressive, the gumballs in Mr. Beck’s video are deceptive. This help could be even much more significant if we can imagine a migration policy different from the one we have. Presently, very few foreigners are given permission to work in the United States. The immigration policy is focusing on those who want to settle permanently. If we make it easier for foreigners to come and work in the United States, then almost instantly many businesses would be revitalized, similarly as that previously mentioned meat processing plant. Suddenly, manufacturing many products in the United States would become profitable again. On the other hand, even those poor immigrants, after saving some money, would at some point seek a better job. Many of them would return to their countries and invest their savings in starting a business. This new business would support not only the family of the owner but also families of people employed there. For the sake of argument let us assume that a guest worker would stay in the United States, on average, five years and then return home and use the money made here to build prosperity in the home country. Assuming further that the productive time of an average individual is about 30 years, we can clearly see that just one job in America, a job that often an American prefers not to take, can help six foreigners to build their prosperity in their countries of origin. This can transpire into life-changing opportunities for advancement for hundreds of people in these poor countries. The most important benefit is that these poor immigrants working here would enrich Americans in the process, as well. It is such a simple win-win solution that most politicians and media pundits have difficulty seeing it. As some say, the darkest spot is always just under the lantern. In his video, Mr. Beck advocates for immigration policy as it was before 1965, as legislated by the Immigration Act of 1924. This legislation was structured to limit the immigration of people from Eastern and Southern Europe, perceived as being of an inferior stock. In the view of many, in particular it was targeted to prevent the immigration of three million Polish Jews. Until 1965, essentially all immigration of Asians was banned. Plainly, racism was the undertone of all of the immigration laws until 1965. For Mr. Beck, this was the golden era of immigration. During those years, with some fluctuations, for every 1,000 Americans, an average of one immigrant was admitted to the country every year. If we can imagine a community with a population of 1,000, that would be the equivalent of one person moving in per year. Would it even be noticed in the life of the community? Could we even call it immigration? In the years 1925–65, immigration was at such low numbers that it did not affect this nation nor the outside world. Practically speaking, we may say that during those four decades, there was no immigration at all. With a straight face, Mr. Beck claims that he is pro-immigration but with limited numbers. On his website he asks NumbersUSA to be called an “immigration-reduction organization.” He does not dot the “i” and he does not tell us that, practically, he wants to reduce the immigration to zero. Could it be that Mr. Beck is right? Maybe we really need to cut immigration to almost zero, as it was before 1965. Telling us that with a larger population we would have more polluted lakes and rivers is demagogy big time. Most Western European countries have a population density much higher than here in the United States — do they have an environmental catastrophe? With a sweet smile, Mr. Beck is poisoning the minds of his listeners with the thought that a tight labor market is the best friend any worker ever had. What he does not say is that this is not sustainable. For Mr. Beck, the world has not changed since 1924. At that time the economy was mostly a local affair; most goods were consumed within the same area in which they were manufactured. At about that time, the first airplanes took off for commercial flights. The first radio transatlantic telephone service was established in 1927 and it cost $16 ($232.54 today) for a three-minute conversation. People who invented computers were just being born. In 1965, the first transatlantic telephone cables were already in service, as were the first transoceanic airline flights. Television was still mostly local; however, the first satellite transmissions were taking place, which evolved into commercial applications in the early 1970s. The year 1965 can be seen as marking the end of the world’s rebuilding after World War II. Western Europe was in full swing with economic prosperity, followed closely by Japan. “Global village” was the term of the season. People around the world realized that the economy was becoming global. The leaders of the United States recognized that the era of splendid isolation was over. Those were the circumstances behind the changing of the immigration law that allowed more people into the U.S. Mr. Beck even today cannot comprehend the importance of the changes that took place between 1924 and 1965. He did not notice the mass transportation systems that can affordably move people and goods around the globe. He posts his views on the internet but he has not gotten it yet that, thanks to the internet, employees of a company in Iowa can have their desks in India. Today an American worker already competes directly with workers in China or Mexico, and this cannot be changed. We can only decide whether this foreign worker works, spending his money and paying taxes, here or abroad. Without these foreigners working in that meat processing plant, unemployed people in that community would be competing for a few jobs at Walmart and McDonald’s. Mr. Beck is pulling the wool over people’s eyes when he says that with fewer immigrants there will be more well-paid jobs for Americans. Immigrants give our economy a momentum that benefits both immigrants and Americans. If the immigrants go, prosperity would disappear too. It would not take long before Silicon Valley would be somewhere in Malaysia, and Wall Street in Shanghai. Mr. Beck points out that in some communities, Americans are suffering due to the negative side effects of increased immigration. This is a dirty propaganda trick as Mr. Beck is taking the negative effects of present laws that ridiculously limit legal immigration and turning them around in order to advocate for even more bizarre laws that practically eliminate legal immigration. Due to the current faulty laws, we have about 11 million people living, using Mr. Beck’s term, outside “the social fabric of this country.” We know very little about who they are and what they are doing. Before the border control became tougher in the 1990s, many Mexicans were crossing the border illegally, going back and forth for seasonal jobs, and were staying with their families in Mexico when there was less work here. With the increased difficulty in crossing the border, many of these migrant workers brought their families here. Now they stay here, regardless of whether there is work or not, adding to the burden that some communities have. The solution that Mr. Beck advocates is in making the currently ridiculous laws even more absurd and believing that in some magic way the problems will disappear. Chicago is doing well now and is a prosperous city. Detroit is not doing equally well; neither is St. Louis. There are no borders between Chicago and Detroit, or many other places of poverty in our country. Nevertheless, not all the poor from the whole country come to Chicago, only those who can find a job here and are willing to bear all the risks and inconveniences of relocating. Similar market mechanisms will work on a global scale if we would relax immigration laws and let in those foreigners who can find work here. This is obvious for someone who understands how the economy works. Unfortunately, Mr. Beck does not. Immigrants accelerated America’s economic growth, and through this, some of the problems of our society became more visible and bothersome. Education and health care are the best examples. However, even if all children of immigrants would leave, will our schools suddenly teach math as well as in Germany or Korea? If all immigrants leave, will our health care be suddenly affordable? No doubt, immigrants made our problems more visible. The viciousness of Mr. Beck’s video is in sneaking the message that by cutting the number of immigrants, we would have all our problems solved. The only strength of the Mr. Beck video is that it is a masterpiece of propaganda. Mr. Beck can easily sell sand to Bedouins. As with every piece of propaganda, the purpose of it is not to find the truth. It is in arm-wrestling the facts to show that the number of immigrants needs to be cut.